Help us out by subscribing to Make Magazine. 50% of your subscription cost through this site supports Creatorspace directly. When you shop at amazon.com using our link. Amazon will donate .5% of your purchase to creatorspace. This provides attendees with a 20% discount on single ticket purchases. Valid until September 30th, 2017. Excludes: Family Packs, Donations and Supporter Ticket Types. Creatorspace is excited that Darcy Truehan of Yellow Feather Designs has volunteered to teach our first Jewelry Making Class on Saturday August 19, from 1-3pm! 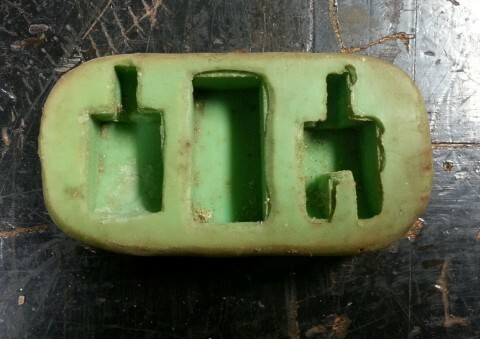 The class will focus on making jewelry from surplus electronic components (of which Creatorspace has lots!). These will be creative and unique works of wearable maker art. Class size will be limited to 8 people and will cost $20 including materials. Creatorspace members will get a 50% discount. You MUST complete the registration form on the Creatorspace website in addition to RSVPing here in order to reserve your place in the class. The Robot class we've been teasing for the last few months has finally been scheduled! The 3-part class will begin on Saturday July 29, 1-5pm. 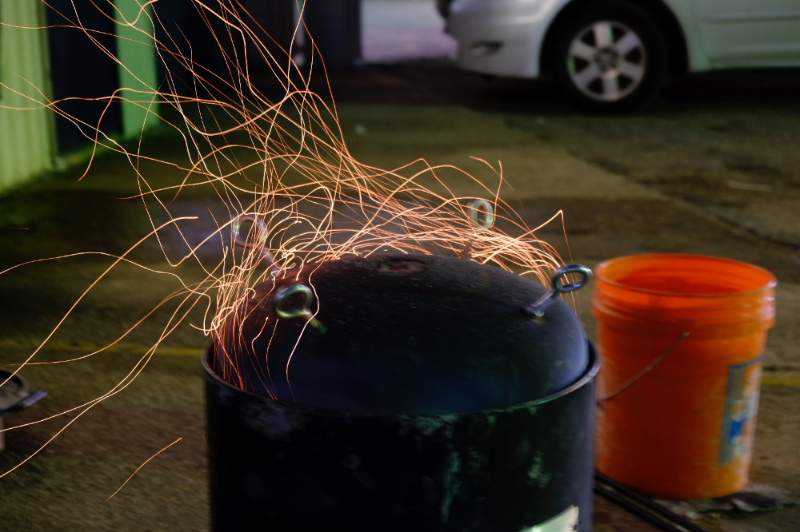 The Houston Summer Maker Space Crawl begins this upcoming Saturday, July 15, 5:30pm - 9pm, and will be hosted by Creatorspace (of course). Our theme will be Molecular Gastronomy - hors-d'ouevres and beverages will be served. The evening is oriented towards adults, but children are welcome. We have finalized the class schedule for June!! The link to register is on the registration tab. More detail about each class and instructor is available on the website registration tab. Creatorspace Grand Opening and Ribbon Cutting Ceremony was last Saturday, and was amazing in spite of the rain! Thanks to our friends at Pique-Pues for being there to feed everyone. Here's a link to our video from the day, made by us! Pictures and videos are being put up at our Facebook page. It was awesome! League City Video on us just went live. Creatorspace has been hard at work since the move at the beginning of the month, rearranging, cleaning, sorting and building, and we are finally ready to welcome you all to the new Space. Starting this Tuesday, April 25, at 7pm, we will be commencing our regular weekly Open House again. 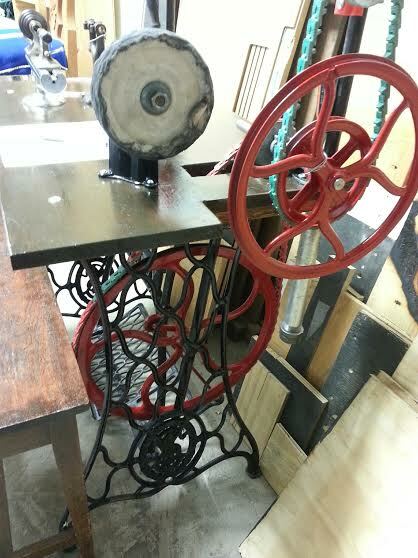 Come by, take the tour, see what new goodies we have (and see some old things you didn't know we had)! We are calling this our "Soft" Opening, in contrast to our Grand Opening on Saturday, June 3, which will be a much bigger celebration of who we are, and our formal introduction to our new neighbors in League City. Stay tuned! Creatorspace's new address is 120 Park Avenue, League City TX 77573, the big blue building at the intersection of Main Street and the railroad tracks. The new Space is 4500 sqft, more than 3x our previous Space. It has multiple rooms, much better parking, and is accessible from the street (no gate!). Check out the pictures on our Facebook page! In case you missed the news, Creatorspace has moved! Thanks to the support of the City Council of League City and the League City Economic Development Office, we have moved to 120 Park Avenue, League City TX 77573 . We are not open this week, (we are still rearranging everything), but we expect to be back open to the public for regular Open Houses before the end of the month! The new place is 4500 sqft, more than 3x the current one. It has multiple rooms, much better parking, and is accessible from the street (no gate!). Pictures coming soon! Please do not go to the old Space, as we have moved out already. Every year Creatorspace has a booth at Comicpalooza, the biggest Comic Book Convention in Houston. This year it will be on May 12-14, at the George R Brown Convention Center. If you've never been to Comicpalooza, you should! It's got comics, film, anime and gaming; authors, actors and artists; makers, and best of all, cosplay. It's awesome! Passes are different amount for each day, so click-thru (and scroll down) for prices. Big Changes have arrived for the Space. We have been in talks with the City of League City for the last few months about the possibility of moving into unoccupied or underutilized properties that are owned by the City. Tuesday night the City Council approved the lease on the new Space!! The new place is 4500 sqft, more than 3x the current one. It has multiple rooms, much better parking, and is accessible from the street (no gate!). We are planning a Grand Opening in the near future, but until then you are welcome to stop by and see the new Space. We have a lot of plans for the increased space and increased visibility, and are looking forward to being a vibrant member of the League City community! We sincerely thank the League City Council, Mayor and the Department of Economic Development for their enthusiastic support, and hard work in bringing Creatorspace to League City!! "Introduction to Autodesk Fusion 360"
Our own Ryan Erskins will be presenting an "Introduction to Autodesk Fusion 360", the cloud-based 3D CAD, CAM, and CAE tool. Fusion 360 is "free for students, enthusiasts hobbyists, and startups" but does require registration. Ryan will be demonstrating its uses in a 3D printing environment. All Creatorspace Library Presentations are free and open to the public. This month we will be in the Children's Activity Center. Please ask at the reference desk if you need assistance finding the presentation. Creatorspace is happy to announce the start of Classes at the Space! We are still working on the details of scheduling and registration. Expect more information about the classes and instructors, and a formal announcement very soon. There are even more new activities in the planning stage for the new year, so stay tuned! This Tuesday is the last of our regular weekly Open House's for this year. All of us are taking some time off to make Xmas presents, attend holiday parties, and spend time with friends and family! We will be back at Freeman Library on January 9th for Retro Technology Night; and we will be resuming our regular Open House schedule Tuesday, January 10th. So come on by tonight, bring your projects, bring your questions, come on out and make something! Creatorspace is happy to announce the receipt of a $5k grant from Albemarle, for the purchase of new tools for the Space. 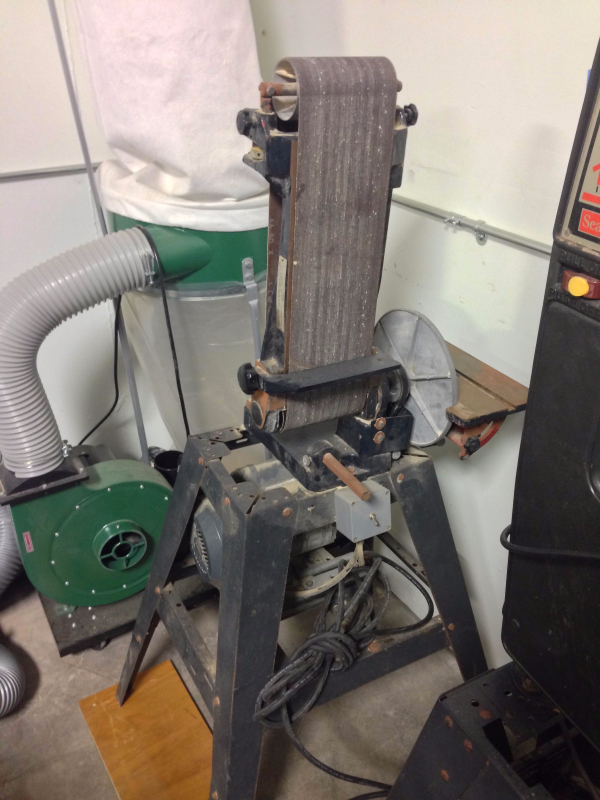 We have just received the first tool purchased, a Grizzly G0619 6" x 21" Mill/Drill. We are super excited about this new addition to the Space! Last Friday (12/2/2016), Creatorspace held another class at the Cleveland Ripley Neighborhood Center on creating art using Inkscape and our mobile 50w laser cutter/engraver. Scott Milligan built on the concepts from last month, and introduced using the laser to create 3D art. Mobiles and tabbed boxes were demonstrated, and the students got to work with Living Hinges to make book covers, using the extension for Inkscape. This past Saturday, Creatorspace helped Evelyn Meador Library in Seabrook celebrate the Grand Opening of their new iMaker Space. Although the weather was awful, a lot of people still showed up to see the new Space! Our own Fitz Walker was on NPR's Engines of Our Ingenuity last Tuesday talking about the Maker Revolution! Listen to him here (3:36 min). The first set of computers refurbished by Creatorspace were distributed last Thursday evening to the students in the computer class at the Cleveland-Ripley Neighborhood Center. Two additional computers (and 20 turkeys) were also raffled off to an audience of over 300 people. Thanks to everyone who helped us make that happen! Creatorspace will be conducting another Art Through Technology program at the Cleveland Ripley House in Pasadena, where we will be instructing 50 Pasadena High School students how to use lasers to create art. Creatorspace will be supporting the 2nd Barnes and Noble Mini Maker Faire, November 5/6 at the Baybrook Store. Creatorspace will be at the Houston Maker Faire again this year, as we have for the last three years, since it started. The Faire will be two days, Saturday and Sunday, for the first time. We will be bringing our usual assortment of toys, tools and exhibits, including interactive projects and games. Advance tickets are available, and you can get a 51% discount on tickets using Creatorspace's Promotional Code just for being on our mailing list! The October Creatorspace Library Presentation will be "Introduction to Blender - 3D Modeling and Graphics Software"
Blender is free and can be downloaded at www.blender.org. All Creatorspace Library Presentations are free and open to the public. All the month of September, Creatorspace owns the display case in the lobby of the Freeman Library. Our members have populated the shelves with all kinds of projects. We will be adding and rearranging all month, so stop by and enjoy. News: Freeman Memorial Library 3D prints hand for 5 year old. Patrick was in Creatorspace Tuesday night talking about this. First Saturday for August is the 6th and its coming up quick. This month we are doing, LASER CUTTING. From 2:00 pm to 5:00 pm. This meeting is free and open to the public. Bring your questions. You never know until you ask. A cool talk for a hot summer. 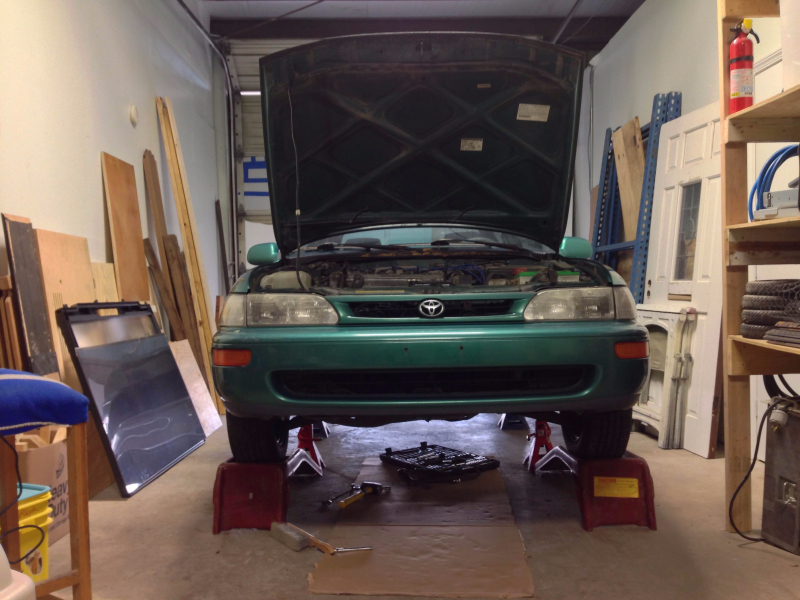 On December 11, 2015, Creatorspace member Chris Loyd drove out of Houston in his Subaru Forester. By December 31, he had driven the ice road to Tuktoyaktuk, Northwest Territories, Canada. Join us for a discussion of what he learned and the people he met on his 10,000 mile round trip journey. We will not be open for First Saturday this month in observance of the 4th of July. Have a wonderful holiday weekend. Hope to see you next Tuesday the 5th. It includes interviews with some of our Officers, pictures, and interviews with the Freeman Library as well. The 'Space is back from Comicpalooza!! Thanks to everyone who visited the booth, and special thanks to everyone who helped move and crew the booth. Comicpalooza was (again) a great success! We talked to so many people, and got so many chances to show off our stuff. Even though we're tired, we are still meeting this Tuesday, 7:00 to 10:00pm. If you got a chance to visit us this weekend, come on by. Bring your projects, bring your questions, come and build something! Come by and see what's going on at Creatorspace! Join us this weekend for Comicpalooza at the George R. Brown Convention Center. It will be held Friday, Saturday and Sunday. We will be located in the center of all of the action with other Maker Spaces booths. Lots of fun things to see and do. And don't forget to stop by our booth just to say HI. On May 23rd Scott, Brent and Dave took the Laser Cutter out to the Cleveland-Ripley Neighborhood Center in Pasadena for our very first Art Through Technology Class. Scott led the class of about 45 highly engaged Pasadena High School students and we cut and engraved several dozen of the student's designs. two weeks before High School graduation! Come by and hear how it went. Come see the CNC table, up and running and project ready! Need to work on things for a while! Come on by. Need to ask some questions! Come on by. Tuesday night just not working for you. Come on by. The May Topic will be "Open Source Ecology". 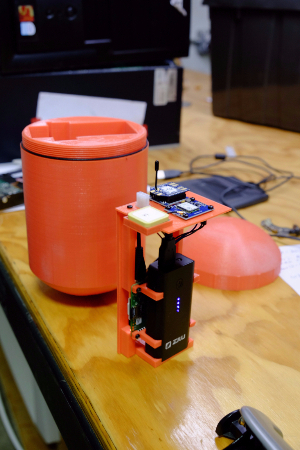 This organization is developing and sharing open source industrial machines. Their goal is to increase innovation by open collaboration. Creatorspace is happy to announce that we are the recipient of a Seeds For Change grant from Neighborhood Centers Inc. for our Art Through Technology Program. Seeds For Change is a small grant initiative that anchors Neighborhood Centers Inc.’s commitment to cultivating closer relationships with Houston’s many cultural organizations and partners. Creatorspace’s Art Through Technology Program will be using the grant to establish a series of workshops utilizing multimedia art, sculpture, and design to provide hands-on exposure to using small scale fabrication technologies for creating art, specifically using a laser cutting and engraving machine. The Art Through Technology Program intends to serve high school age young adults as well as older individuals, of all genders, from diverse backgrounds who are interested in technology and creativity. The program hopes to empower people to create their own design solutions to problems, and empower them to express themselves and their cultural identities, while also giving them marketable workplace skills. Course material will cover the design process, project development, equipment operation, and the underlying science that makes everything work. We hope to demystify technology and empower our students. Monday night the 27th we had a photographer from the Houston Chronicle shooting pictures of the space for an article. Scott (president) had done a phone interview with the reporter earlier. We had a good showing of projects and the space. Not sure when it will be published. Lots of activities coming up. This will make the 3rd showing for Creatorspace. We are already making plans. And don't forget Houston Mini Maker Fair towards the end of the year. But there's plenty going on now also. May will be the first outing for our Lasser Cutter. Demonstrations of how to use it in making art. More info to follow. Third Monday at Freeman Memorial Library 7pm. Presentation and info to follow. Remember every Tuesday Night open to the public 7pm. Join us this weekend for the B&N Mini Maker Faire! Come take a look at our Egg-Bot, Tesla Coil, experience Raspberry Pi withScratch programming for kids, learn about Arduino capabilities, and much more. Members will be exhibiting a sampling of equipment and projects done at the Space. We would love to have you present; please let us know if you're available. If you've been interested in Creatorspace, but Tuesday night Open House doesn't fit your schedule, please visit us at one of our off site public events; we're looking forward to showing you what we do. If you've been interested in Creatorspace, but Tuesday night Open House doesn't fit your schedule, this is another great way to see what we do. 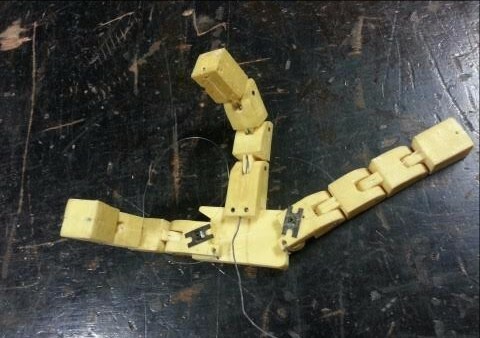 We looked at a prototype prosthetic hand and the flexible mold used to make plastic components. 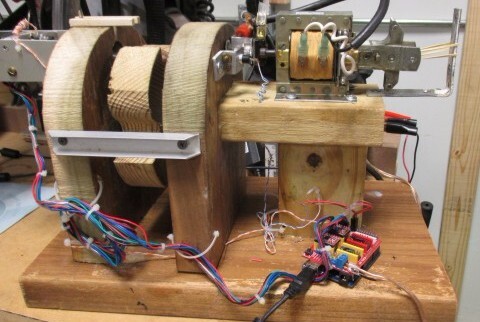 An Arduino will be used to provide control for robotic applications. We will be exhibiting a sampling of equipment and projects done at the Space. If our Tuesday night Open House doesn't fit your schedule this is another great way to see what we do. For those wanting to be more involved, we're always welcoming new members. Monthly memberships are only $40, which includes access to our Member Only Mondays at the Space, and (contingent on approval) a key with 24 hour access. 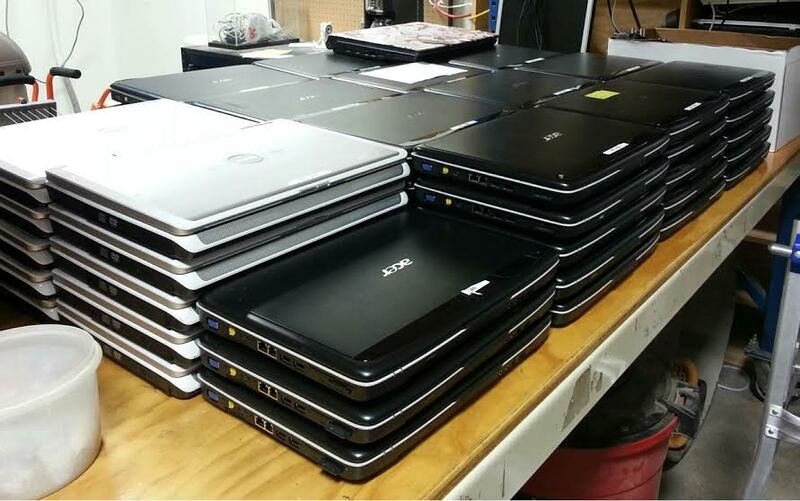 Our instructors will walk you through the step by step process of installing Linux as we will be refurbish dozens of donated laptops for the Neighborhood Center. Once completed, they will be distributed to students who wouldn't otherwise have access to a computer in their home. This is your opportunity to learn how to install Linux while helping your community. Sand casting aluminum has been a focus for some of our members; this past week we machined several pieces on our lathe. If you're interested in learning more, we'd love to discuss it at our next Tuesday Open House. Members have enjoyed utilizing the foundry. 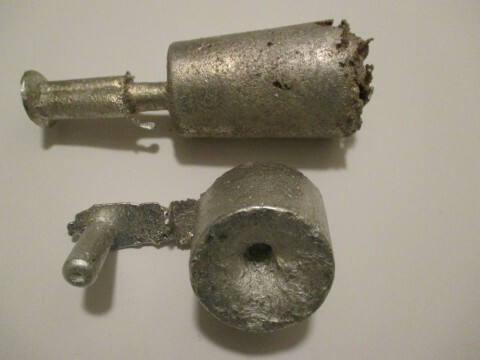 Sand casting aluminum has been an educational experience; we have been learning through trial and error. Join us for the next step when we machine some of these casts on the lathe, and to see our new kiln, this Tuesday at our Open House. We will be signing a new lease at this location soon. We look forward to another great year. Now that we are finally settled in, our plan is to begin upgrading our aging power tools. 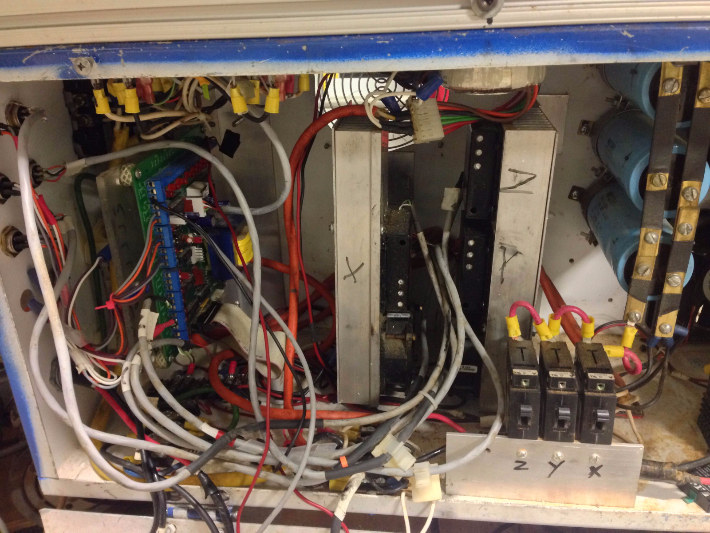 Renovations of the CNC are currently underway, we are troubleshooting the wiring, and hope to have it available soon. Creatorspace members have been working on their cars recently. If you need advice, or have expertise to offer, please join us. Hey, Don't miss out on this Tuesday's upcoming Open House. To all who came to celebrate our Grand Opening Celebration. Our Grand Opening was amazing! We couldn't have hoped for a better turn out! Thank you to all who came out to celebrate this special occasion. We hope you will be back soon. We have open house every Tuesday @ 7pm, hope to see all of you there. 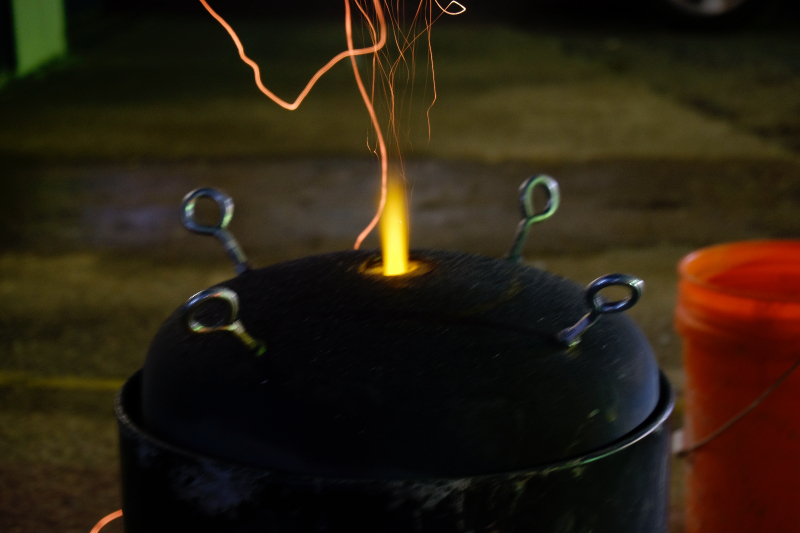 Sunday night we fired up the foundry again. 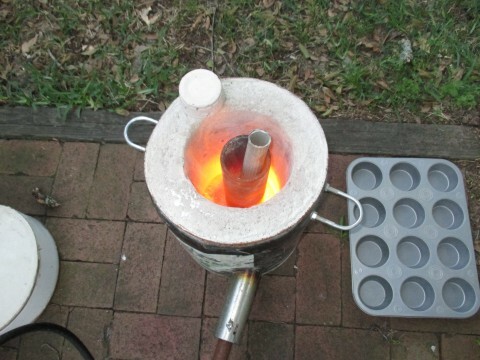 This time we went about with a bigger crucible, the larger surface area helped melt the aluminum faster giving us a much bigger poor. In quick order we demolished all the cans from the party into a single large ingot. Speaking of heating things up. Can ice be used to effectively spot cool our next summer event? We start scale model tests on Tuesday evening at the Open House. Come find out if this idea is an effective solution or just a bunch of hot air. 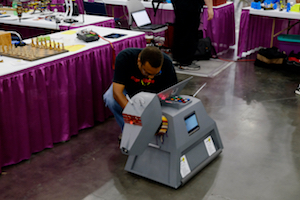 The Houston Mini-Maker Faire is coming to the George R. Brown Convention Center on November 14th and we are organizing projects to make the creatorspace booth even bigger than before. One idea is to tether a giant helium balloon shaped like creatorspace logo above the booth with a video camera on board that guests can control with a display and joystick. Come help us design this and plan other amazing projects for this year's Mini-Maker Faire. The GoPro has been delivered to the lucky winner. Congrats we hope to see some cool videos down the road. SpaceVR.co is still running their Kickstarter and has 15 days left if you would like to help fund it. Celebrating One Year at the space! creatorspace is celebrating! Saturday, August 15th at 3:00pm. Come celebrate with us on Saturday, August 15, from 3:00pm to whenever we close the doors. There will be food and beverages, all sorts of tech, and the friendliest and most helpful geeks you will ever meet. Many of you have already come to the space, and have helped us set up, but all the paperwork is in and we are now officially open to the public! creatorspace is the local makerspace in the Clear Lake/Bay Area. We exist to promote and encourage technical, scientific and artistic skills through individual projects, social collaboration, and education. The mission of creatorspace is to improve the world by creatively rethinking technology. creatorspace was incorporated way back in April, 2012. We had already been meeting in the warehouse behind EPO for a year at that point. We have come a long way since then, and finally, as of last September, we have our own space!!! We are located in the Clear Lake Business Center, just north of El Dorado Blvd on Highway 3. Here is a flyer for the event. Please post it someplace if you are able! Hey, Don't miss out on this Saturdays Grand Opening! Everyone's hard work and donations have paid off creatorspace passed all inspections, increased the tool library, and gained new membership. Our official paperwork from the city is sitting in the office and we are ready to celebrate. Join us as we mark another milestone in creatorspace's continuing success. If you would take the time to please click the link below and resister. This just helps us get a good idea of how many people are planning to attend so we can plan food accordingly. Food, drinks and GoPro, provided for the party by SpaceVR. Check out their project video below and head on over to their Kickstarter. Hey Don't miss out on this Tuesday's upcoming Open House. Projects and events are gearing up as the space settles in to its new home. Join us this, and every Tuesday, at 7 PM for our weekly open house to get a taste of everything going on at creatorspace. Also, be on the look out for exciting information reguarding our Grand Opening Celebration August 15th. creatorspace returns to Clear Lake Freeman Branch Library with our monthly presentation series. This month we are pleased to host Johnny Adams for a talk on remote controlled battleships. Check out the Texas Naval Brigade Facebook and the national organization too see some of the awesome things in store. 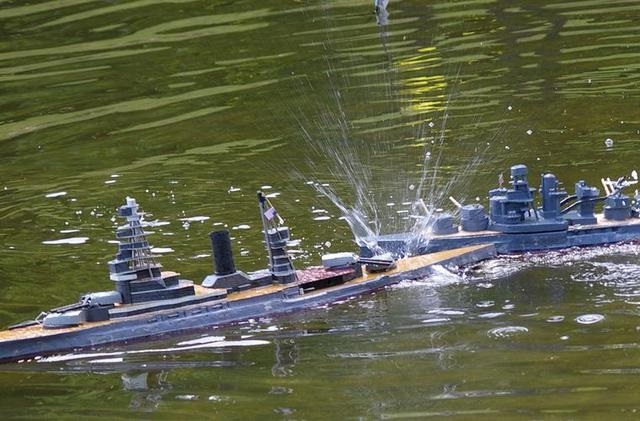 If scale naval warfare is your thing, or you just want to expand your RC knowledge and skills this is the time to join us at Freeman Library. Every Tuesday creatorspace opens its doors to the public and invites everyone to share their projects, progress, and creativity. Check in on how the space is developing, use or contribute to the space's resources, or just settle in for some good conversation. We look forward to seeing you at the next Open House. Additionally to any who have pledged funds for the CNC, we now need to start collecting them. Please bring your pledge to the next meeting, contact Patrick Pecoraro at president@creatorspace.org. Or submit by Paypal with a note that it goes toward the CNC purchase. Everyone's hard work and donations have paid off creatorspace passed all inspections, increased the tool library, and gained new membership. Our official paperwork from the city is sitting in the office and we are ready to celebrate. Mark you calendars for August 15th starting at 3 P.M. Join us as we mark another milestone in creatorspace's continuing success. And Party! Details to follow. creatorspace has rolled out a new program to aid with tool acquisition. Every month 2 tools, one large and one small, will be selected, by member popular vote, to be purchased with specifically donated funds. Once donations for a tool matches the retail price the tool will be purchased. If a tool fails to reach the amount needed within the month, funds will be rolled over to the next months tool. To date, the Tool of the Month fund is responsible for our welder and eyefi card. 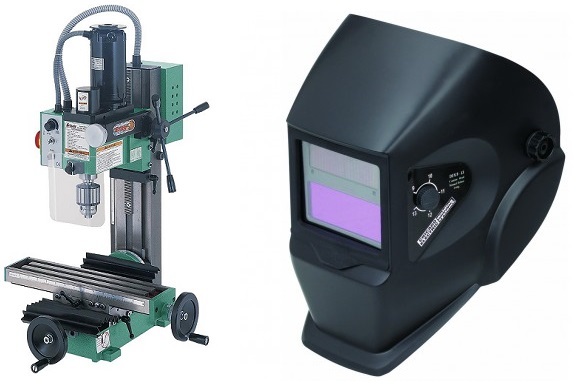 The current Tools of the Month are a CNC mill and an auto-darkening welding helmet. You can donate by dropping cash or check in the appropriate coffee tin, atop the fridge in the workshop, or by donation via Paypal with the desired tool specified in the notes. Tuesday July 7th Open House @ 7pm. 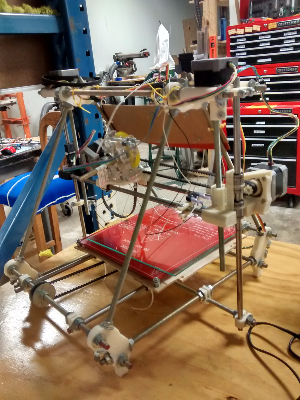 Get hands on with 3D Printing - Thanks to generous donations the Space currently has two Prusa Mendel I2 Printers, one Prusa I3, and a Rostock mini Delta Printer, all in various stages of completion. Now is a great time to dive into every aspect of 3D printer set up. CNC 3D Router - Funding has been reached with a couple members filling in the last gap but we are still taking more donations. In the mean time we need to create a place for us to put it here at creatorspace. To that end are tearing down the big shelf in the back corner and appreciate any help doing so. 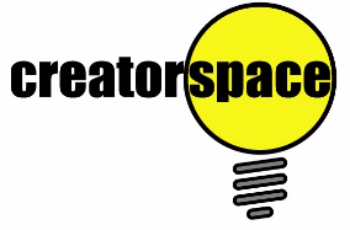 Bring your own projects - Creatorspace supports all Creators and welcomes all community projects, ideas and expertise. Drop by for trouble shooting, tips or just some good old fashioned conversation. More Pictures - Of the space, of the con, of the tools. Tuesday June 30th Open House @ 7pm. Learn to make Vinyl Signs. Go from conception to finished product. We have one of our own, our treasurer in fact Kerry Newman, giving a workshop on how to use the vinyl cutter he has given to the group. 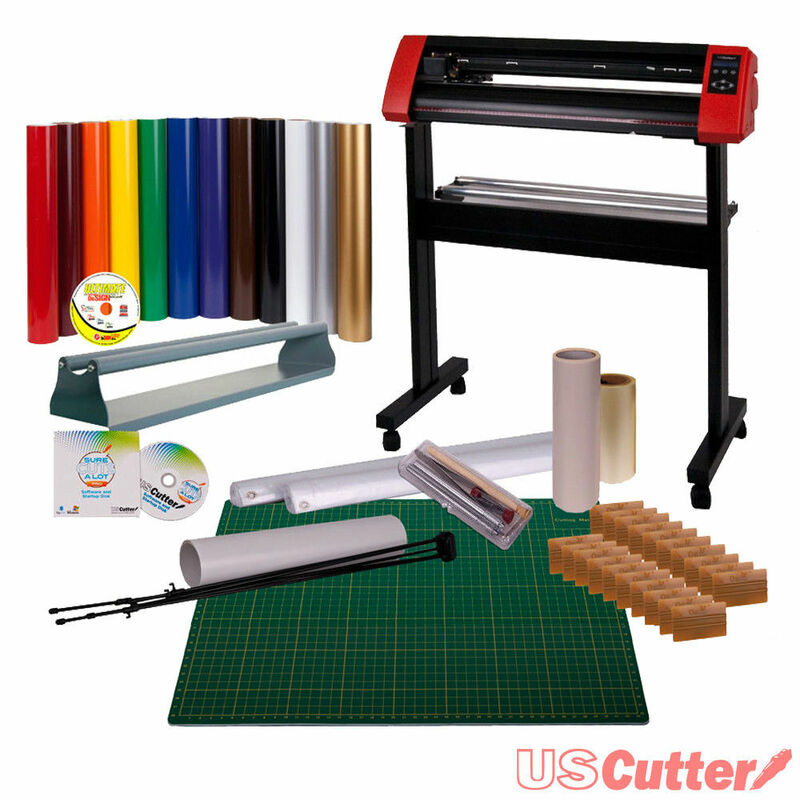 Learn how to take your concept, make a design, cut it out on various vinyl and turn it into a finished robust product. Cutter not the same as in photos. Creatorspace is back at the Clear Lake City-County Freeman Branch Library this Monday, June 15th at 7:00pm. This month's presentation is "K-9" created by Creatorspace member Fitz Walker. 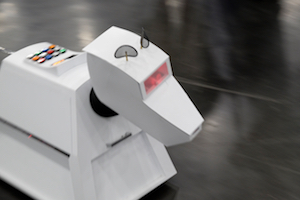 K-9 is one of the best reproductions of the robotic sidekick from the classic series "Doctor Who" and was a hit at Comicpalooza. Fitz will discuss the technology used to produce this show-stopper. Whether you are a "Doctor Who" fan or are interested in remote control, electronics and mechanical fabrication, we hope you will join us for this fascinating presentation. 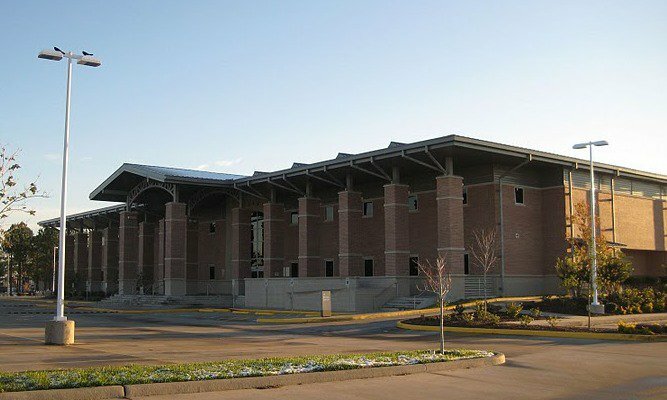 Freeman Library is located at 16616 Diana Lane, Houston TX 77062. Practice your soldering skill - We continue building the 13x13x13 Arduino- based LED Cube (that's 2,197 LEDs!). We have supplies and jigs ready for individuals wanting to learn, test, or refresh their soldering skills. 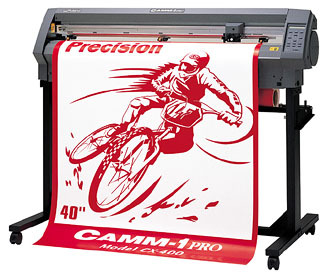 CNC 3D Router Opportunity - creatorspace has been given the option of buying a very nice CNC routing table. Solid 80/20 aluminum table with Bosche 3HP router and Gecko Driver servos. Build area is approximately 29"x39"x6" This item is being funded by our members and we are still taking donations, if you would like to help with the cost and make your own contribution. Please see Patrick Pecoraro we appreciate anything you can spare. We are currently at about 60% of our goal and have until July to meet it. creatorspace remodeling -creatorspace members are hard at work to bring the space a more efficient work space. Currently, we are in the middle of tearing down the main storage shelf in the back left corner and moving the items to new shelving along each wall. We hope this will allow better access at a to tools and parts at a glance. Please feel free to us feed back as we try and make the space better for every one. 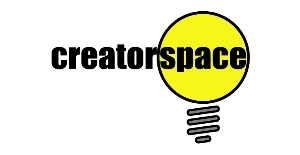 Bring your own projects - Creatorspace supports all Creators and welcomes all community projects, ideas and expertise. Drop by for trouble shooting,tips or just some good old fashioned conversation. Catch all the creating: Game Nights, Tool of the Month, Library Presentation Series, Tues. Open House, Comicpalooza, and Grand Opening. Now that all required inspections are complete, Creatorspace shifts its focus to bigger and better things. Projects and events are gearing up as the Space settles in to its new home. Join us this, and every Tuesday, at 7 PM for our weekly open house to get a taste of everything going on at Creatorspace. Also, be on the look out for exciting information reguarding our Grand Opening Celebration sometime in June. Creatorspace invites you to its weekend Game Night. Take a mental break from building, developing, or destroying, and join in some friendly competition. 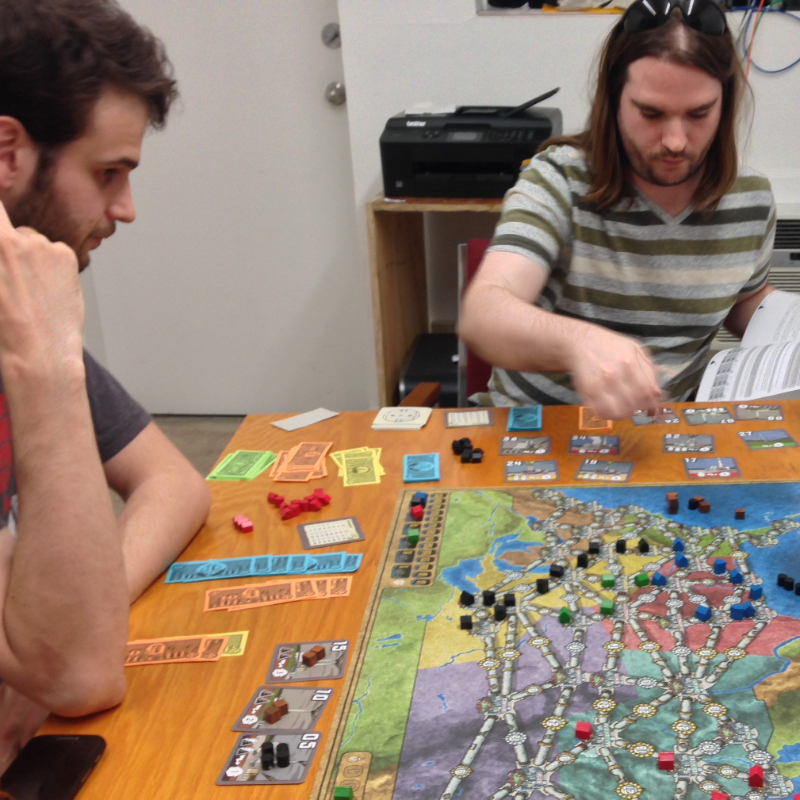 Our current game library includes Dominion, Power Grid, Risk, and Scotland Yard. Game Night is open to all; new players and new games are always welcome. Check the forums or our calendar for scheduling. Creatorspace returns to Clear Lake Freeman Branch Library with our monthly presentation series. This month we are pleased to host Bill Swann, PE, for a talk and demonstration on Solar Energy Systems. If you have dreams of going off the grid, or just becoming more energy conscious, this is the time to join us at Freeman Library. Creatorspace takes its show on the road for Comicpalooza at George R. Brown. Join us as we demo our tools, toys, and projects to the public, you might even catch a glimpse of this or one of these. If you have a project you would like to display let us know so we can show it off. Creatorspace has rolled out a new program to aid with tool acquisition. Every month 2 tools, one large and one small, will be selected by popular vote to be purchased with specifically donated funds. Once donations for a tool matches the retail price the tool will be purchased. If a tool fails to reach the amount needed within the month funds will be rolled over to the next months tool. 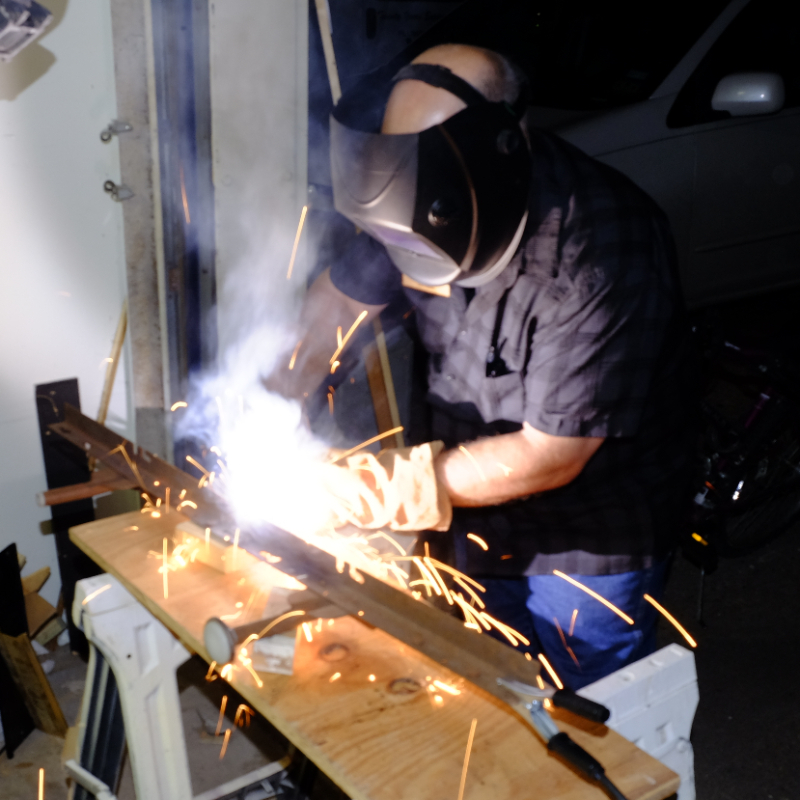 To date, the Tool of the Month fund is responsible for our welder and eyefi card. 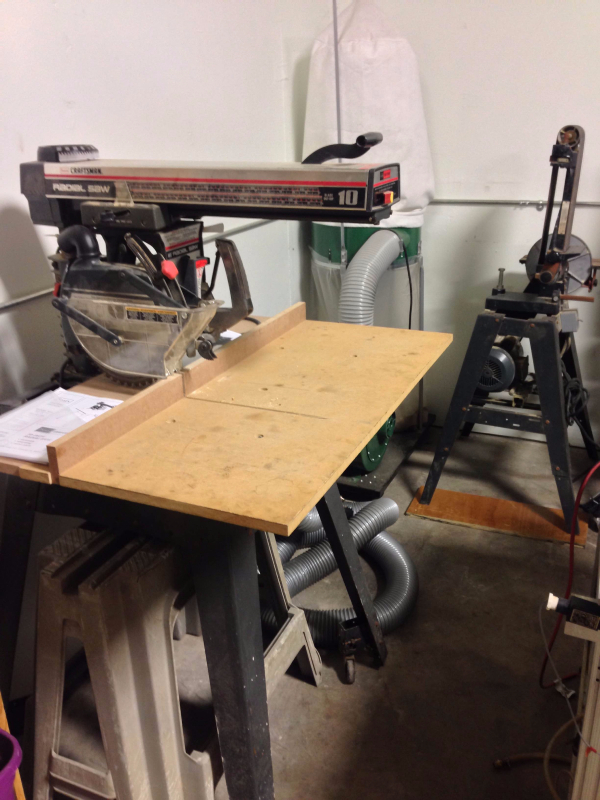 The current Tools of the Month are a mill, model up for debate, and an auto-darkening welding helmet. You can donate by dropping cash or check in the appropriate coffee tin in the workshop or by donation via Paypal with the desired tool specified in the notes. Everyone's hard work and donations have paid off as Creatorspace passed both electrical and HVAC inspections. We are currently awaiting our official paperwork from the city to announce a Grand Opening Event, but reserve some calander space for late June. Celebrate with us as we mark another milestone in Creatorspace's continuing success. Preview all the exciting Creatorspace May events: Game Nights, Group Projects, Monthly Presentation Series, and Comicpalooza. Mark your calendars for Making. May looks to be an exciting time as we wrap up preparing for our occupancy permit, unroll new projects and Meet-ups, and head to Comicpalooza. Join us this, and every Tuesday, at 7 PM for our weekly open house to get a taste of everything going on at Creatorspace. Creatorspace is staring a weekend Game Night and you are invited. Take a mental break from building, developing, or destroying, and join in some friendly competition. 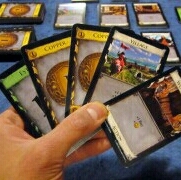 Our current game library includes Dominion, Power Grid, Risk, and Scotland Yard, new players and new games welcome. Check the forums or our calendar for scheduling. Creatorspace returns to Clear Lake Freeman Branch Library with our monthly presentation series. Organizers are currently planning to talk on home solar power systems. If you have dreams of going off the grid, or just becoming more energy conscious, this is the time to join us at Freeman Library. Creatorspace takes its show on the road for Comicpalooza at George R. Brown. This is our opportunity to demo our tools, toys, and projects and let the public know what being a creator is all about. If you have a project you would like to display let us know so we can show it off. All the leg work has been done, hopefully all procedural obstacles have been cleared, Monday, May 11th is our big walk-through inspection for an occupancy permit. Once the dust settles be on the lookout for celebration and even more awesome projects as Creatorspace officially opens its doors to the public. Creatorspace is closer than ever to stable 3d printing at the space! Both the Prusa I2 and Rostock Mini Delta printer have completed numerous prints and are being honed for speed and precision. If you are interested in print trouble shooting or the firm/software side of 3d printing now is the time stop by Creatorspace. Also, the Prusa I3 is being rebuilt and assessed from square one with a goal of being print ready for Comicpalooza. 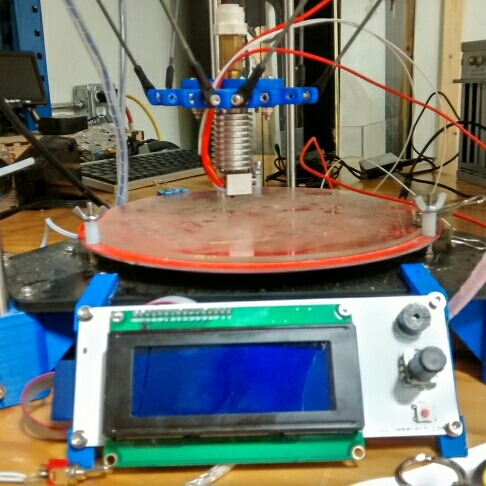 If assembling, wiring, and running a 3d printer from the ground up is more your speed come and lend a hand. Creatorspace welcomes creators of all backgrounds and hope to see you and your project and our open houses. Join Creatorspace for our first Sunday game night from 4:00-8:00 PM Sunday, May 3rd. 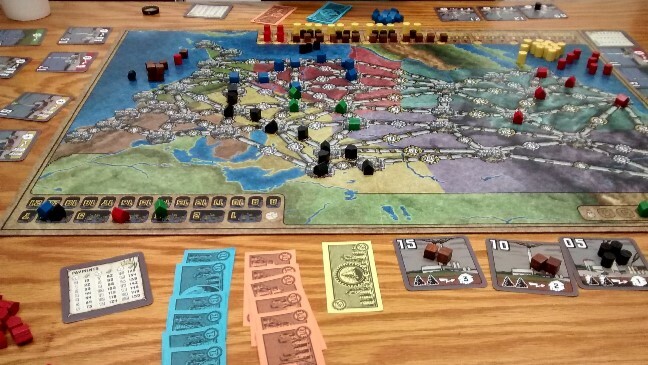 Dominion and Power Grid will be on tap so join us for a round and plan on pizza if you're hungry. Error404 Robots Advance on Creatorspace at Open House 4/27. Find this Error 404 at the Tuesday Open House . 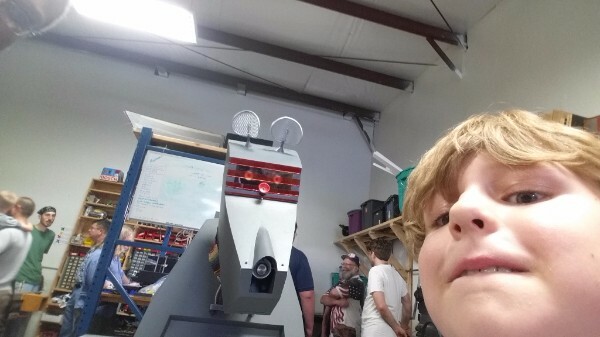 You might have meet the Error 404 Robotics Team at the Lee Innovation Lab opening, so come out and see more of what the have to offer. Creatorspace is happy to host this group of young creators as they present on their work with robotics this Tuesday, April 27. Our Prusa I2 is almost print ready! Help us put on the finishing touches and celebrate the inaugural print. The past weeks have seen many new individual projects; come check out what others are working on or bring in your own projects. A variety of tune ups have been made to the Rostock Mini, lend a hand and see if we can get 2 of 4 3D printers in working condition. Exciting progress and up coming attractions at Creatorspace . Creatorspace has applied to be an Adafruit Hackerspace, this means we will qualify for a base discount of 30% off retail pricing for qualified products for purchases over $250. Most of the required upgrades to the space for our occupancy permit have been completed and we look forward to hosting a Grand Opening soon. Creatorspace will be back at the Freeman Branch Library Monday, May 19. We are currently planning on a hobbyist solar energy lecture. Creatorspace will also be attending Comicpalooza, May 22-25, so come out and see our new projects or just geek out with us. 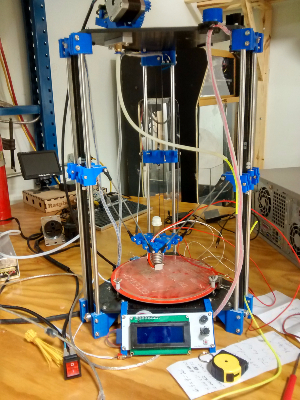 Advances towards 3D Printing - Thanks to the continued efforts of one dedicated group member our Rostock mini Delta Printer is closer to being operational. Help to trouble shoot or learn with us as we attempt to perfect our prints. Breath a Little Easier - We are entering the home stretch on work needing to be finalized before inspection, we are putting the finishing touched on out dust collection system at the moment. If you haven't been to the space in a while come check out all the changes. Join Creatorspace May 22-25 at Comicpalooza. Come see all our associated projects and the people behind them; or, just geek out with us. Creatorspace will be back at Freeman Library in May at 7:00pm. Tentative topic is solar energy systems for the hobbyist. Creatorspace has come a long way in the past year, and we are gearing up for another push forward. Please lend your voice and vision in tonight's open forum meeting. 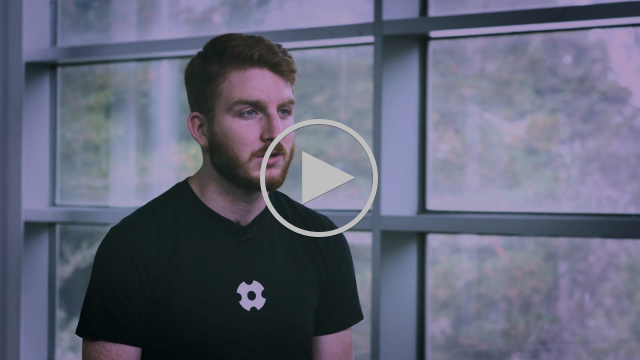 Your opinions will help shape how Creatorspace grows in the coming year. Get hands on with 3D Printing - The Space currently has two Prusa Mendel I2 Printers, one Prusa I3, and a Rostock mini Delta Printer, all in various stages of completion. 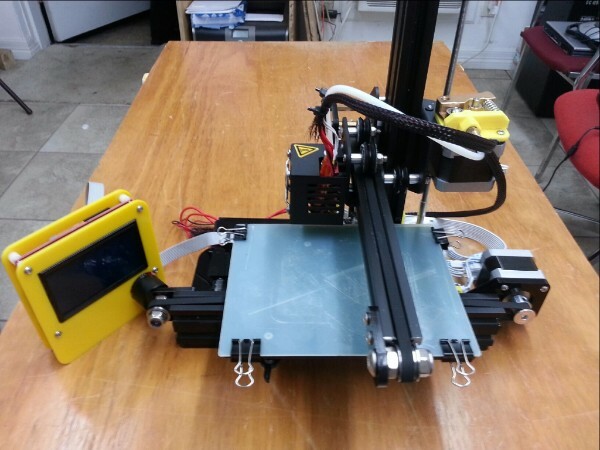 Now is a great time to dive into every aspect of 3D printer set up. We are looking for ambitious tinkerers to help get these printers up and running. Chime in on what you would like to see at Comicpalooza - You may have met us last year at Comicpalooza, we are currently in talks about our booth and panel discussion for this years outing. All feedback on topics and projects to show off at this years convention are welcome. 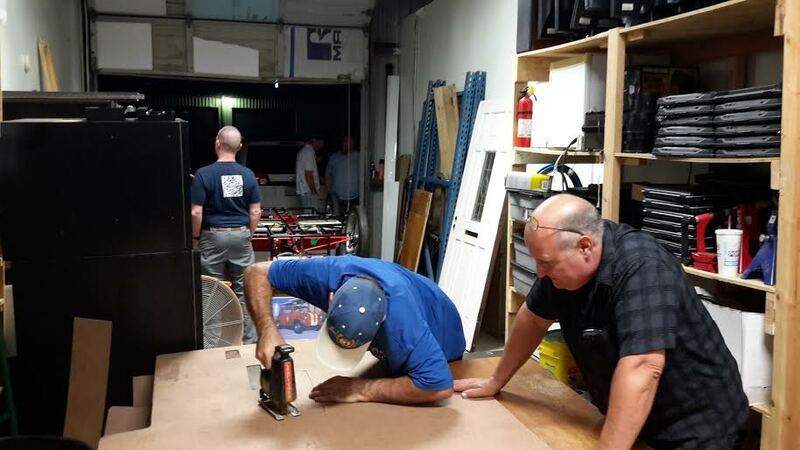 Prepare to lose all your quarters - Creatorspace members are hard at work to bring the Space a MAME Cabinet. Currently, we are evaluating HyperSpin. Work is being done to find a stable dedicated computer but the test run last week saw some classic NES games run. Creatorspace will be back at Freeman Library on Monday, April 20 at 7:00pm. Tentative topic is an introduction to Inkscape. 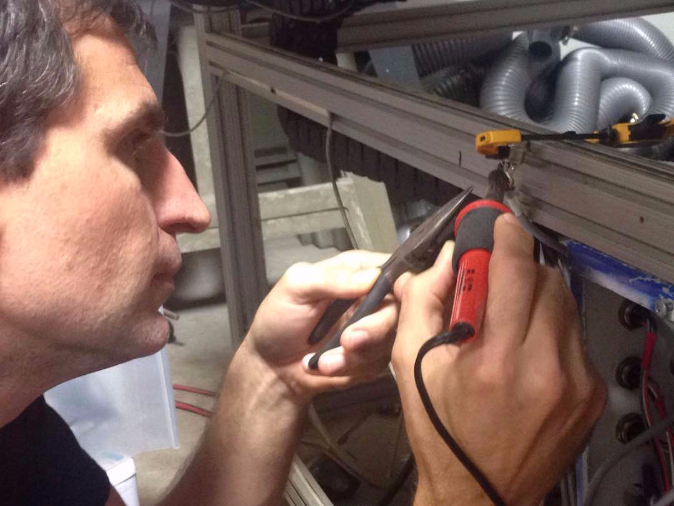 Prepare to lose all your quarters - Creatorspace members are hard at work to bring the Space a MAME Cabinet. Currently, we are evaluating MAME Front-Ends and hope to have a dedicated computer working for testing/playing soon. Creatorspace @ Freeman Library - Monday, April 20 at 7:00 PM. Tentative topic is an introduction to Inkscape. Things are getting busy around the Space this year! This week we will be discussing the upcoming elections for the Board, possible changes to the Bylaws, and upcoming events in February. We will also continue building the 13x13x13 Arduino- based LED Cube (that's 2,197 LEDs!) Here's a link to a video of an 8x8x8 Cube, so you can get an idea of the coolness of this. We are now in the soldering stage, so if you'd like to learn how to solder, practice your technique, or just get involved in a group project, come and help! Another project just beginning is setting up a Raspberry Pi as a surveillence camera/door logger for our front door, to keep track of our comings and goings. Anyone interested in helping me figure out how to do this, come out on Tuesday. Also, check out our new shelves! Last Monday was a very productive work day. We now have a place for members to keep their projects at the Space! Open House is every Tuesday evening at 7:00pm. Come by and see what we've been up to! Bring your projects, bring your questions, bring your experience! Food and drink will be available. 15502 Old Galveston Rd, Webster TX 77598 Unit #202. There is a lot going on in the coming months! Creatorspace will be back at Freeman Library on Monday, February 16 at 7:00pm. Topic is "Installing and Using Linux". Linux is a free, open source operating system, which can be installed on almost any computer. It's particularly good for older, obsolete machines that can't be upgraded anymore. If you've got an older, Windows XP machine that runs terribly slow, a netbook which never ran fast, we will show you how to breath some new life into it with Ubuntu Linux. 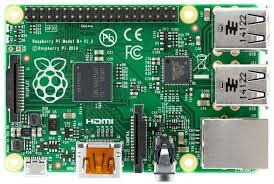 We will also demo a Raspberry Pi, a small, inexpensive, single-board computer that can be used as a computer, a media center, a game platform, or a surveillance camera (see above). 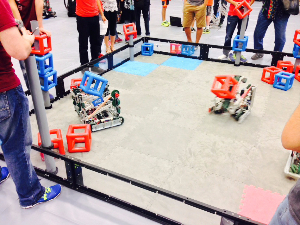 Creatorspace has been invited to have a table at the Robot Jubilee on Saturday, February 20th at Clear Falls High School in League City. Come out and support the next generation of Makers. Creatorspace will also be participating in the Grand Opening of the Jocelyn H. Lee Innovation Lab at the Freeman Library on Saturday, February 28th. This is an amazing resource for our community. Come out and see what the excitement is about! Further in the future, we will be doing a Teen Tech Demo at the Fairmont Library on Tuesday, March 17 at 5:00pm. Even more events are coming soon. Stay tuned! 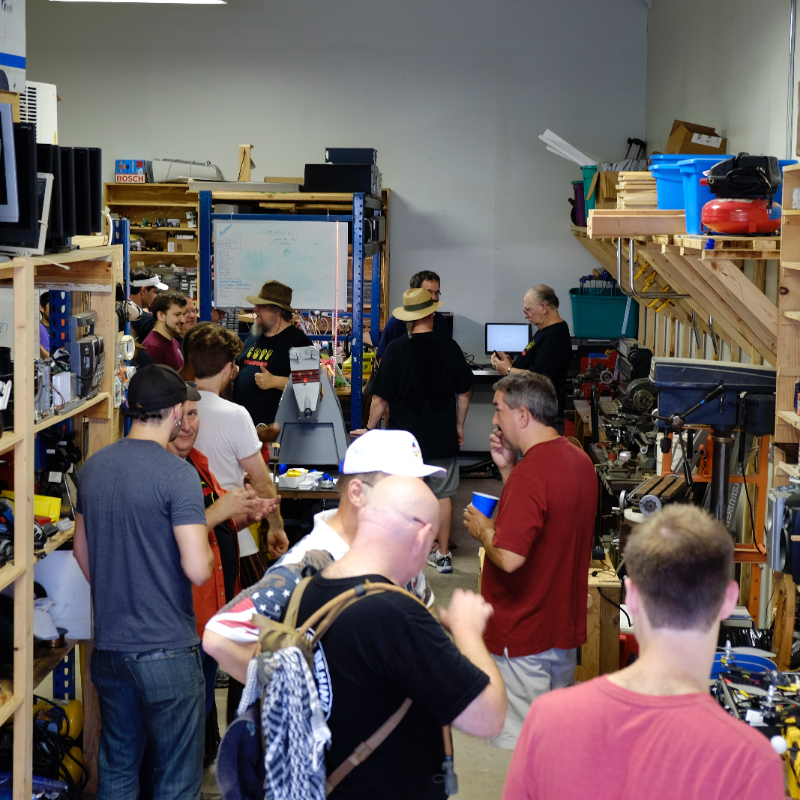 Instead of our regular Tuesday night meeting on January 20th, Creatorspace is taking the night off to go to the re:3D Open House.re:3D is the creator of the Gigabot 3D printer, but that is not all they are about. They are a local company, and a friend of both Creatorspace and the Freeman Library (who actually has a Gigabot in the new Lee Innovation Lab). Come and join us - 2100 Space Park Drive, Suite 102. Flyer is posted in the Forum. Monday, January 19th, is MLK Day, and is a holiday for many of us. Depending on everyone's plans, we are scheduling a work day at the 'Space to build shelves all along the north wall. Planning and scheduling will be taking place in the Creatorspace Forum, so please come out if you can help. Note: You need to be logged into Google to see the Forum. Because we are going to re:3D next week, election discussions are moved to the January 27th meeting. If you are at all interested in having a say in the future of Creatorspace, or just want to see how it all works, please come. We will be discussing the election of Officers and Directors, and setting the date of the Annual Meeting and elections. Creatorspace will be back at Freeman Library on Monday, February 16 at 7:00pm. Topic is still TBD. Suggestions are welcome; again, please go to the Forum to volunteer and discuss. Freeman Library is located at 16616 Diana Lane, Houston TX 77062. Creatorspace elections will be on February 24. In compliance with our Bylaws, that will be our Annual Meeting. Among other things, we will be electing the new Board of Directors, modifying the Bylaws, and providing the year in review activity and financial review. All paying members are eligible to become voting members, as well as to be on the Board of Directors. We had a great meeting last week! We saw lots of people we hadn't seen in a while, including Matthew from re3D. Join the discussion in the Creatorspace Forums about future group projects. Creatorspace will be conducting elections in the near future. Details below. Open House is every Tuesday evening at 7:00pm, open to the public. Creatorspace will be back at Freeman Library on Monday, February 16 at 7:00pm. Topic is still TBD. Suggestions are welcome. Creatorspace elections are coming soon. In compliance with our Bylaws, we are going to have our Annual Meeting. Among other things, we will be electing the new Board of Directors. Paying members are eligible to become voting members, as well as to be on the Board of Directors. If you are at all interested in having a say in the future of Creatorspace, or just want to see how it all works, please come on Tuesday, January 20. We will be discussing the election of Officers and Directors, and setting the date of the Annual Meeting and elections. We hope everyone was able to celebrate the Solstice holidays of their choice. Creatorspace is back open on Tuesdays. There will be no Open House December 23 or December 30. Creatorspace is closed for the holidays. The space will be open to members with key privileges. It's getting close to the end of the year, so if you are looking for an extra tax deduction, Creatorspace is a 501(c)3 non-profit, and donations are tax-deductible! All of our paperwork has not yet arrived from the IRS, but here we are on the IRS website. The next meeting of Creatorspace at Freeman Library will be Monday, December 15 at 7:00pm. The topic is Arduino Programming 101, led by David Overland. We will be going over the basic half-dozen or so things you need to know to use the Arduino programming language, using an LED square built by Mike Chrismer as a demonstration platform. We will step through the thought process of writing code, and explain why, not just how. If you've never programmed before, but want to create something using an Arduino, this is the meeting for you! Open House is every Tuesday evening at 7:00pm, open to the public. We have rearranged the space to make it more project friendly. Come by and see what we've been up to! Bring your projects, bring your questions, bring your experience! Food and drink will be available. Come out on and see what we've done! There will be no meetings between Christmas and New Years. The space will be open to members with key privileges. Do Not Park in front of our next-door neighbors!!! - they are open for business 24/7 and need access to their driveway at all times. In general, we can't park in front of any of the businesses. We are encouraging members to park out front on Tuesdays to make it easier on our guests. We can fit six cars in front of our unit, double parked (more if they're tiny). We can park in front of the office outside the gate, in front of the chain-link fence, and anywhere along the bayou except for the places clearly marked reserved. I hope everyone had a great Thanksgiving! Creatorspace returns to its regularly scheduled activities this week. The next meeting of Creatorspace at Freeman Library will be Monday, December 15. The topic is (tentatively) Arduino Programming 101. We will be going over the basic half-dozen or so things you need to know to use the Arduino programming language. If you've never programmed before, but want to create something using an Arduino, this is the meeting for you! Do Not Park in front of our next-door neighbors!!! - they are open for business 24/7 and need access to their driveway at all times. In general, we can't park in front of any of the businesses. This Monday Creatorspace will be at Freeman Library at 7:00pm. James Hardy will be presenting Off-Grid Aquaponics. Learn about growing fish and vegetables in an attractive, productive, integrated system, right in your own backyard. Open House is every Tuesday evening at 7:00pm, open to the public. We have rearranged the space to make it more project friendly. 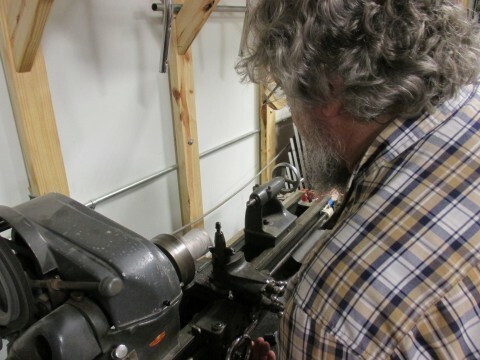 The internet has been upgraded, the lathe is operational, people are making things! Creatorspace website hosting moved this week to Dreamhost.com. If you had some difficulty finding us online, that's why. Thanks to Patrick for getting it all back up and running. We can fit six cars in front of our unit, double parked (more if they're tiny). We can park in front of the office outside the gate, in front of the chain-link fence, and anywhere along the bayou except for the places clearly marked reserved. We are working with out neighbors to arrange more parking opportunities. Maps will be available soon. If you missed us at Maker Faire last weekend, we are bringing it all to the Freeman Library's 50th Anniversary Celebration next Saturday, November 8, from 10-4. Please come by and see us, and help the Library celebrate! Freeman Library will be celebrating its 50th anniversary on November 8th. Creatorspace will be sharing its Maker Faire exhibits out on the patio to help them celebrate! The next meeting of Creatorspace at Freeman Library will be Monday, November 17. James Hardy will be presenting Off-Grid Aquaponics. Learn about growing fish and vegetables in an attractive, productive, integrated system, right in your own backyard. - It's official! Creatorspace is finally a 501(c)3 non-profit!!! Donations are now tax-deductible! All of the paperwork has not yet arrived from the IRS (there's always more paperwork), but here we are on the IRS website. Patrick has put together a video chronicling Creatorspace move in day, and activities since! It's up on our website, and on our YouTube channel. The new website looks great! I'd like to encourage everyone to start using the Forums link on the website. It requires a Google account to post, but is read-only for everyone. 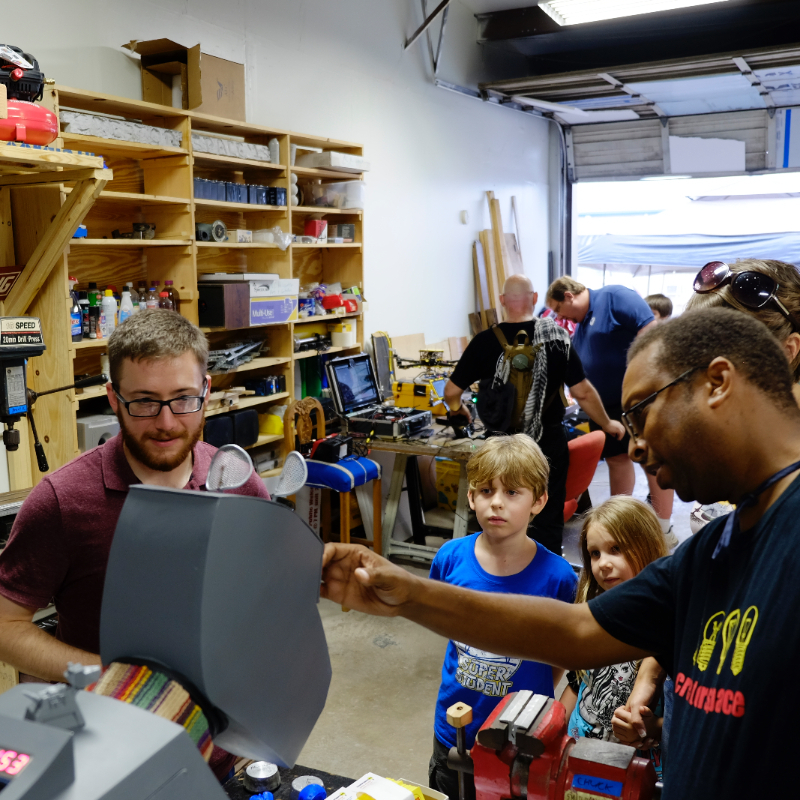 The more people use the Forum, the fewer emails get sent out for coordinating activities like workdays, or exhibits for the Houston Mini Maker Faire. Forums are the best way to find out if anyone is at the 'Space, until we get something automated. It is also the place to ask questions, post general interestnews items for the group, plan projects and share designs (like for the ping pong launchers). It is also where we will post organizational status and news. This week we will be basking in the success of our Houston Mini Maker Faire exhibit last Saturday. Our booth was easily the largest and most diverse exhibit of all the makerspaces at the Faire! I am continually surprised by how awesome we are. Pictures will soon be posted to the website. Thanks to Kevin for overseeing our participation and coordinating with the Maker Faire event sponsors over at Innovation Spark. And thanks to all the members who brought projects and manned the booth, and thanks to everyone who came by and visited with us. If you missed us at Maker Faire, we are bringing it all to the Freeman Library's 50th Anniversary Celebration next Saturday, November 8, from 10-4. Please come by and see us, and help the Library celebrate! Open House is every Tuesday evening at 7:00pm, open to the public. Bring your projects, bring your questions, bring your experience! Food and drink will be provided. Like us on Facebook, follow our Twitter, join our Circles, check out our Videos. CreatorSpace has a booth at the upcoming Houston Mini Maker Faire! If you've never been to a Maker Faire, they are billed as The Greatest Show and Tell on Earth. They are family friendly events designed to show the cool stuff you're working on, and to see cool stuff other people are working on. Our booth has an assortment of CreatorSpace favorites, but it's lacking one last important thing: You and your project. 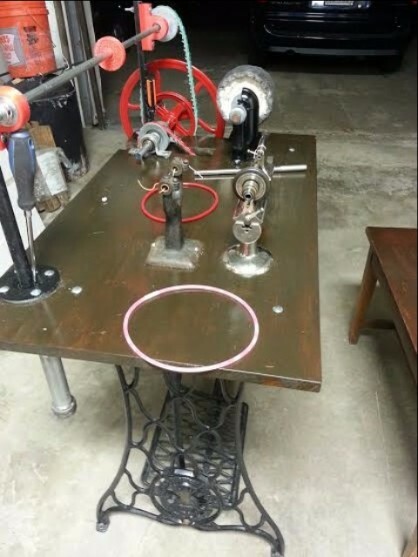 Do you have a project, or a hobby or anything that you'd like to show off? If you have something that you'd like to show, please email creatorspaceinfo@gmail.com or come to our final planning meeting on Tuesday the 28th at 7:00pm. I'm sure there will be pizza. This week we will be back at the Freeman Library. On Monday, October 20 at 7:00pm, Mathew Benson will be giving a presentation on the Kerbal Space Program. We will be meeting upstairs in the Computer Lab (due to early voting in our usual room). Bring your laptops with you so you can follow along! 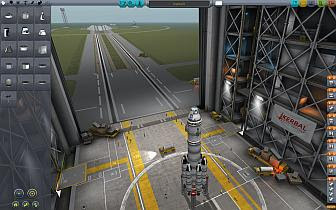 From the KSP website, "KSP is a game where the players create and manage their own space program. Build spacecraft, fly them, and try to help the Kerbals to fulfill their ultimate mission of conquering space." 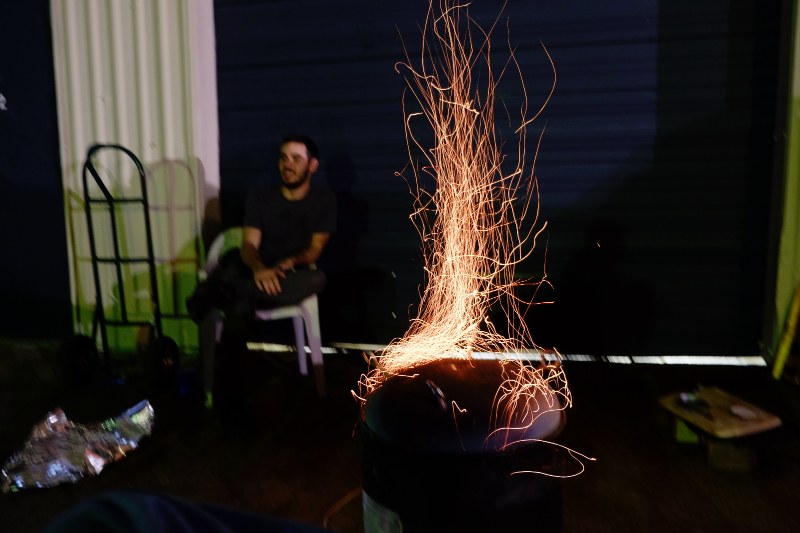 - Check out our writeup at the Houston Maker Faire website! Mark your calendars for Saturday, November 1, and come out and support all the Makers in the Houston Greater Metropolitan Area! Food, fun, technology, and activities for the kids! Moving into our fourth week, there is someone doing something in the 'Space nearly everyday of the week! The new address is 15502 Old Galveston Rd, Webster TX 77598 Unit #202. Come out on and see what we've done! Do Not Park in front of our next-door neighbors!!! - they are open for business 24/7 and need access to their driveway at all times. In general, we can't park in front of anyof the businesses. Mondays are members-only nights for work, planning and projects. And - for those members with key privileges - the 'Space is always accessible. Forums are the best way to find out if anyone is at the 'Space, until we get something automated. It is also the place to ask questions, post general interest news items for the group, plan projects and share designs (like for the ping pong launchers). It is also where we will post organizational status and news. The next meeting at the library will be Monday, October 20 at 7:00pm. Mathew Benson will be giving a presentation on the Kerbal Space Program From the KSP website, "KSP is a game where the players create and manage their own space program. Build spacecraft, fly them, and try to help the Kerbals to fulfill their ultimate mission of conquering space." We are no longer meeting at Odyssey Hobbies, but we encourage everyone to continue to support their business and their hobbyist meetings. 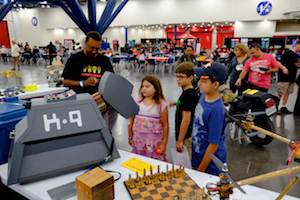 Houston Mini Maker Faire is coming up on November 1 at the Stafford Convention Center. Creatorspace will have several booths, so we are looking for volunteers and projects to show off. It's a great event to participate in, and a lot of fun. Please post to the Forum if you'd like to bring a project or help crew the booth. It's guaranteed to be a good time! Moving into our third week at the new 'Space, things are looking really good. The workbenches are assembled, the lathe and break press are getting a cleaning and a tuneup, and shelves and tables are being built. We have a refrigerator and microwave, computers are getting upgraded to Linux, we have a mailbox (complete with bills! ), and wifi. 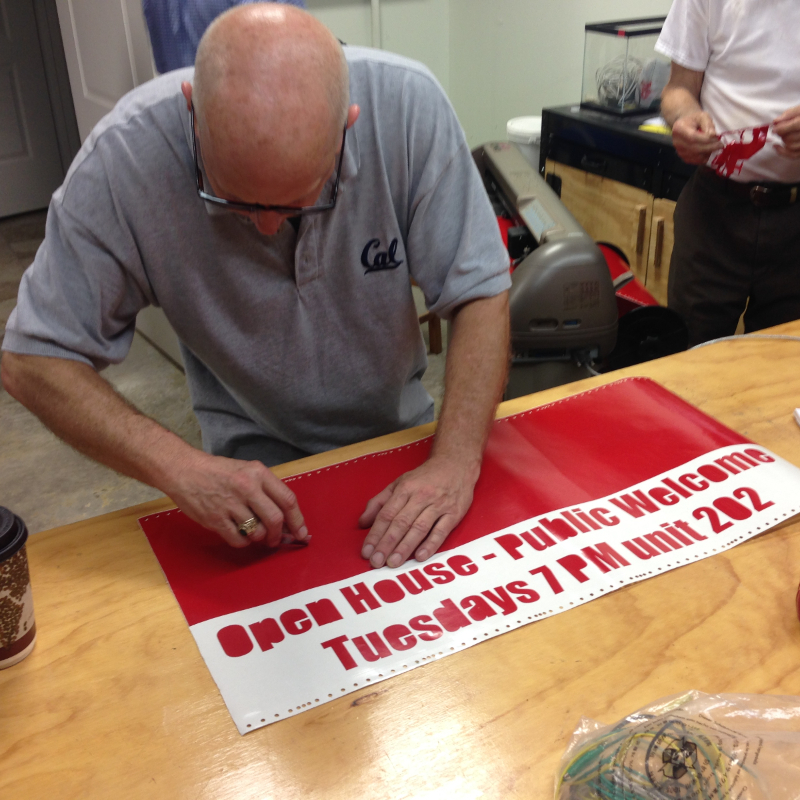 Open House is back to Tuesday evenings at 7:00pm, open to the public as always. Mondays are members-only nights for work, planning and projects. And - for those members with key privileges - the 'Space is always accessible. The new website looks great! I'd like to encourage everyone to start using the Forums link on the website. It requires a Google login to post, but is read-only for everyone. 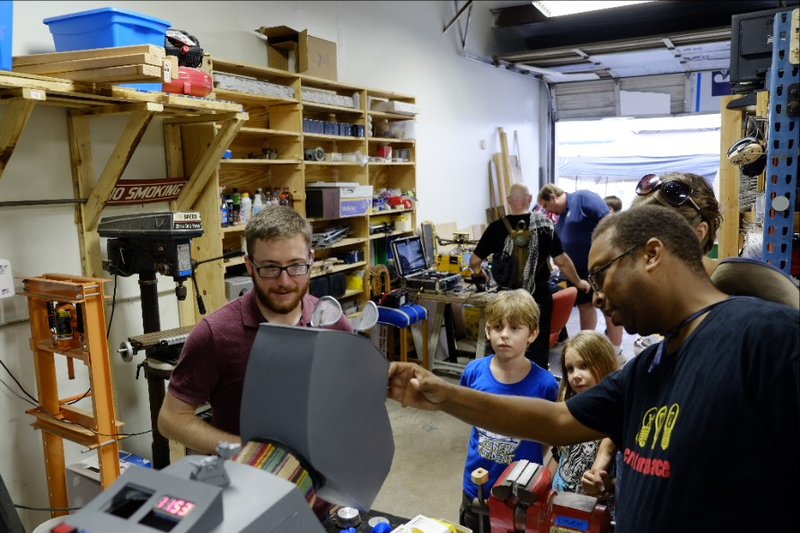 The more people use the Forum, the fewer emails get sent out for coordinating activities like workdays, or travel to Houston Mini Maker Faire. This is best way to find out if anyone is at the 'Space, until we get something automated. It is also the place to ask questions, post general interest news items for the group, plan projects and share designs (like for the ping pong launchers). It is also where we will post organizational status and news. The new address is 15502 Old Galveston Rd, Webster TX 77598 Unit #202. Come outon Tuesday and see what we've done! Today at Creatorspace - The New Website is Live! Today Patrick flipped the DNS switch to bring the new Creatorspace.org website online! For the next couple of weeks we will not be meeting at the Library. We will continue moving, unpacking and rearranging at the new Space. Come see us and the new place. This Week at Creatorspace - We have a new Space!!! We did it! We signed the lease on Saturday, and are now paying rent. There's still a few things left to be done on Monday, and we will need a Houston City inspection for our occupancy permits. All that will be done next week. In the meantime, we have the keys and the gate codes, so we need to start making plans. Last weeks Minecraft meeting went really well. We had 35 people, including 12 young Minecraft enthusuasts. We will definitely be doing this again! Now that we have a Space of our own, we need to use this meeting to plan and schedule the move. We have a lot of stuff in storage, and will need people with trucks and trailers to help. Please come and help us make this happen. The meetings are free to attend and people of all experience levels are welcome. Bring your friends. Bring your projects. Bring your questions. Located near El Camino and Bay Area Blvd. We are going to take this opportunity to go visit the new Space. Come early to Odyssey or meet us there at 7:00. We will work out the details on Monday at the Library. Come see the R/C demos of cars and copters. Bring your own project or check out what our members are building. Use the side entrance. The back door stays closed now that we have Air Conditioning. We have been asked to support a group of high school students who will be participating in the FIRST Technical Challenge Robotics this fall. They meet in the Freeman Library Community Room on Fridays from 2:30-5:30. Email us at creatorspaceinfo@gmail.com for contact information. 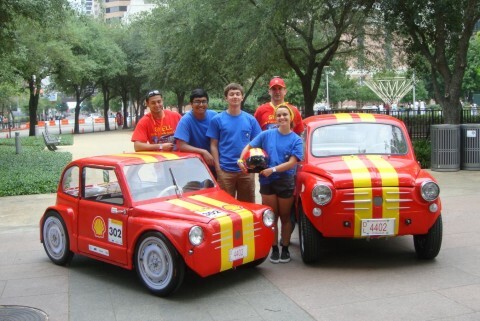 Houston Mini Maker Faire is coming up on November 1 at the Stafford Convention Center. Creatorspace will have a booth again, so we will be looking for volunteers and projects to show off. It's a great event to participate in, and a lot of fun. This Week at Creatorspace - Minecraft and Moving! We are continuing to move forward on leasing our new Space. We have put in a down payment, and the property manager is busy replacing the plumbing, updating the electrical, and fixing the office up. We have turned on the electricity in order to test the new circuits and are working on getting the proper insurance. The new website is more than 50% complete (thanks Patrick & Scott!) and we hope to be moving in before the end of the month. Expect news about our Grand Opening soon! 9-8-14: Our youngest member, Grayson Buchanan, will be talking about how to set up a Minecraft server , and Minecraft in general. Whether you've never heard of Minecraft, or your kids are playing it all the time, come on out. This will be a good one to bring the kids to. The meetings are free to attend and people of all experience levels are welcome. Bring your friends. Bring your projects. Bring your questions. Come see the R/C demos of cars and copters. Bring your own project or check out what our members are building. First, we are happy to let you know the status of our new Space! The Board met with the property manager and the electrician on Wednesday, and we have put a deposit on Unit #202. They are upgrading the electrical, the plumbing, AC, paint and ceiling tiles. When it is ready for move-in, we will sign the lease and start scheduling the move! Because of your generosity, Creatorspace is moving forward to leasing the new space! We have received a copy of the lease, which has been reviewed. We are currently waiting to meet with the property manager and the electrician, to clarify some questions, and to make sure we have a lot of power outlights available. After that, we commit to the insurance, sign the lease, and schedule the move. We currently don't have a firm move-in date, but that should finalized this week. 8-25-14: The MineCraft Server presenter has been postponed and will be rescheduled for a future date. We will still meet to discuss projects and future plans. 8-18-14: The MineCraft Server presenter has Canceled. Will be rescheduled for at a future date. Fitz presents his BIGGEST project yet. Come see what is involved in hosting a version of this popular game. Come try out RC demos and see all the projects our members are building. 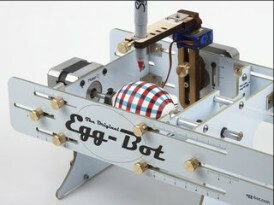 Here is a photo of the new robot being developed by Chris and Garth that was at last week's meeting. This is just one of the many new and interesting projects happening here. I want to thank everyone who has responded so far. With assurances from you all, we can generate almost $800/month, so it won't take too many more of you to make this a reality! The next email will have pictures and a layout. First, is that our 501(c)3 application has finally been reviewed by the IRS! It has been recommended for approval, which means the next step is approval. We are now waiting anxiously for the mail. The address of the place we are looking at is 15502 Old Galveston Road. 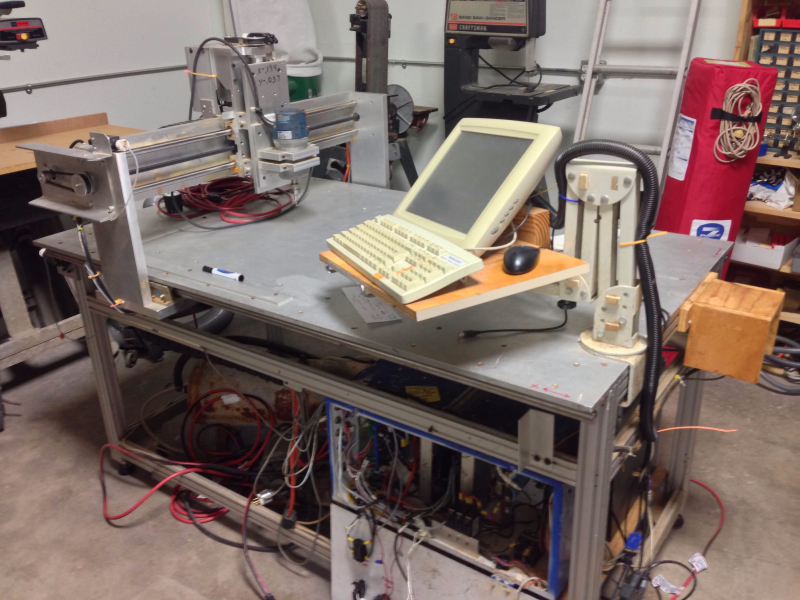 Two lathes, Radial arm saw, Belt Grinder, Brake/Shear, Hand tools, Soldering stations, and a 3D Printer. There are an assortment of electronic components, a telescope, motors, a shop toolbox, and an oscilloscope. In addition, we have the four large workstations, cabinets, and a large AC unit. And a whole lot of miscellaneous. And quite of lot of donated equipment has been promised if we get the space. 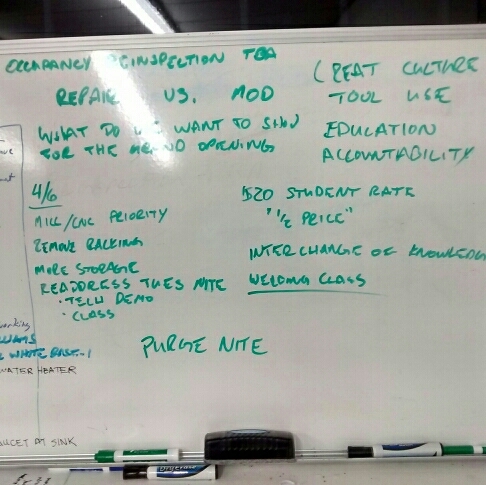 We will of course be adding new tools and outfitting the space continuously, based on inputs from members. Membership is the way to influence what equipment we will have. In addition to tool access, the biggest benefit to membership is the network of members themselves. Did you know that you can find the people with the skills you need to take your project or business to the next level by emailing us at ? Paid members will also be welcome to use the space to run a small business from the facility (pending approval by the board). Yesterday I reached out to you about helping us procure a new home for Creatorspace. It has dawned on me that I failed to provided a crucial piece of information about how to help us achieve this goal. Below is a link to our member subscription page, details about each level and what each level runs. For each level we provide a monthly or yearly option. If you prefer you can also make a one time donation. We will also be updating this page shortly with additional benefits, so stay tuned. I'm writing to you because you have shown an interest in Creatorspace. You have been to one of our meetings at EPO, Freeman Library, or Odyssey Hobbies; you have been to one of our classes; or you have met and talked to us at an event such as Comicpalooza or Innovation Day at JSC. Creatorspace is about to take its next step to becoming one of the premier makerspaces in Houston. We have found a property for lease in the Clealr Lake/ Webster area, and are actively gathering the financial resources to be able to move in. In order to do that we are contacting everyone of you to ask for your support. Creatorspace has a possibility for a 24/7 full-time home. We found a 1248 sq ft warehouse/office combo for lease on Highway 3 by El Dorado Blvd. However, it costs more money than we are currently bringing in. The minimum cost to lease the space will be $1000/mo, rent and expenses. 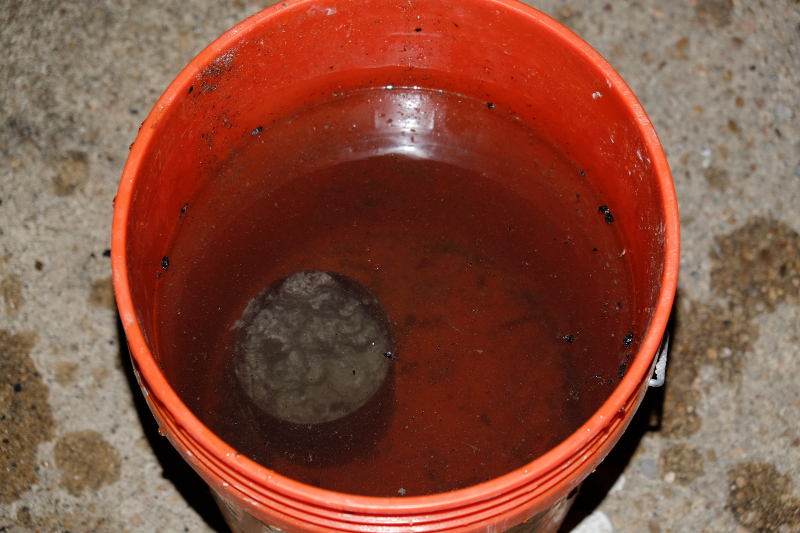 We currently bring in about $300/mo. The cost to move in will just about empty the bank account ($2000). I know this is something that Creatorspace is capable of doing. The benefits will by far exceed the costs. The new space will allow us to create a space of our own, where members can learn, exchange ideas, and make things! Not for just a couple hours a week, either, but all the time. The new space will allow us to bring our tools, workbenches and equipment out of storage, to provide personalized space for our members, and to have regular, hands-on classes and workshops on tools and technologies. When we lease the new space, any support you can provide will be critical for making the rent and paying the bills. In return Creatorspace will have a permanent home that isn't shared with another business, but with the community at large. Right now the donation levels for different privileges are fluid while try to get this to happen, but we're looking at $40-$150/month. We will be updating the Donation/Dues page of the website shortly with more specifics of the new perks of membership at different levels. We have to move rather quickly before someone else rents the space. What we need right now is confirmation that you would be willing to support us, and to what level ($0-$150/month). We won't be able to go forward unless we get enough support from you all. We are not asking you commit yet, but we need to know if we can move forward. But even if you are not interested in ongoing membership, please consider donating to Creatorspace in order to help us create a place for the entire Clear Lake community. We all will benefit.